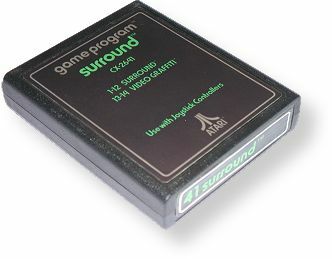 When Atari launched the 2600 in 1977, they offered nine games for sale. These nine games had plain labels with colored text, and the end label had a number on it next to the game name. The number referred to the internal development number of the game - Combat being the first (01). These numbered games were sold in gatefold boxes - the front of the box opened outward like a book. Atari only sold their games in this style for a year - after that, they changed to standard boxes (open from the top) and text labels without the accompanying numbers. This makes the Text # label an interesting collectible, especially when paired with the box. Air-Sea Battle CX2602 "02 air-sea battle"
Basic Math CX2661 "61 basic math"
Indy 500 CX2611 "11 indy 500"
Star Ship CX2603 "03 star ship"
Street Racer CX2612 "12 street racer"
Surround CX2641 "41 surround", "Use with Joystick"
Video Olympics CX2621 "21 video olympics"